894 kilometres from Cape Town, Upington is one of the few urban centres in the least populated province in the country. 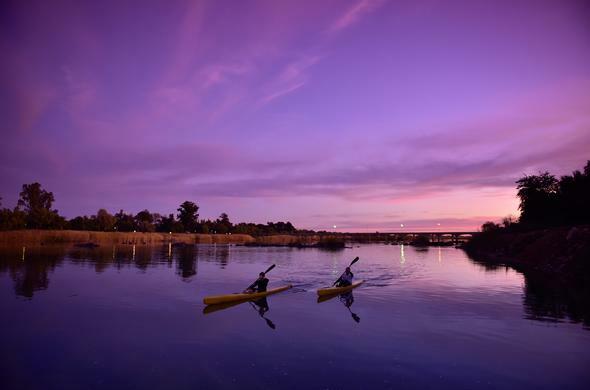 The Orange River meanders through the thirsty expanses of the Northern Cape providing the region's livelihood. The Kalahari-Oranje Museum tells the story of the man largely responsible for kick-starting the fruit-producing industry of the Upington area. It was a nineteenth-century missionary named Reverend Schroder who dug the first canal to provide irrigation from the Orange River. He built the church and mission station which is now the local museum in 1875. The history of Upington and the Lower Orange River is detailed and there is also a rather unexpected life-size monument to the humble donkey in tribute to its role in the development of the Orange River Valley. Vineyards line the Orange River hereabouts and all offer tastings. As they are part of the Orange River co-operative however, once you've visited one cellar you could well have sampled all the wine on offer. There is a full range of sports facilities befitting the largest town of the region. These include an 18 hole golf course, an olympic-sized swimming pool and tennis and squash amenities. Watersports take the form of fishing, speed-boating or water-skiing and if the air is more your thing than water, there are microlighting jaunts to be had. 13 kilometres north of Upington, the Spitskop Nature Reserve is small but well-stocked with zebra and antelope, ostrich and, rather bizarrely, camel. With three walks laid out through the park, this is a good day's outing. Kakamas, 80 kilometres south-west of Upington on the road to Springbok, makes a pleasant stopover on the way to Augrabies Falls National Park. A nineteenth century missionary improvised the canals driven by old-fashioned waterwheels which promoted this obscure backwater to the foremost peach cultivar in the country. The waterwheels help also to irrigate the surrounding vineyards and cotton fields. Orange River Wine Cellars does the same for thirsty travellers. Cool cellars offer welcome shade and a tipple of frosty chardonnay is just the thing to sluice the red dust of the desert off the back of the throat. 120 kilometres west of Upington, the mighty Orange River flings itself suicidally over a granite chasm in a noisy affirmation of life in an arid landscape. The park provides an opportunity to get up close and personal to the explosive power of the cataract. 15 415 hectares of this starkly beautiful part of the country is protected and a variety of antelope and giraffe can be found here, far from the big five theme parks of Mpumalanga and Northern KwaZulu-Natal. Guided night game drives allow a glimpse of nocturnal wildlife. The Klipspringer Hiking Trail is a three-day, two-night trail which carries you into the gorge at the bottom of the falls, past rocks and river. Advance booking is essential as the trail can accommodate a maximum of twelve people and it is closed from October to March due to the heat. Shorter nature rambles are set out in the park. But for those with more energy than time, there's the Gariep Three-in-One excursion which involves mountain-biking, canoeing on the Orange and a short hike through the park. And all this in one day! There's also river-rafting above the Falls, with grade 2 and 3 rapids. Below the Falls, the section of the Orange river that runs through the Augrabies National Park is far from docile. Its grade 4 and 5 rapids rush through gorges and pummel the rocks and provided the momentum for the 1999 Camel White Water Challenge, the unofficial world white-water championship. There are plans afoot to open up commercial rafting in this hithertoe closed area. 40 kilometres south-west of Upington, on the Springbok road, the aloe-strewn Tierberg Nature Garden affords a spectacular view of the islands dotting the Orange River which is at its widest as it meanders through the Keimoes Valley. Orange River Wine Co-Operative has its largest cellar here. Copyright © 2002 Laurianne Claase. All rights reserved. Reproduction in whole or in part without the permission of the author is prohibited.